Shea Stadium was a stadium in Flushing Meadows–Corona Park, Queens, New York City. 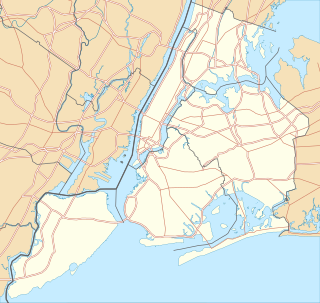 Built as a multi-purpose stadium, it was the home park of Major League Baseball's New York Mets for 45 seasons (1964–2008), as well as the New York Jets football team from 1964 to 1983. The 1997 Major League Baseball season was the inaugural season for Interleague play, as well as the final season in the American League for the Milwaukee Brewers before moving to the NL the following season. The California Angels changed their name to the Anaheim Angels. The Florida Marlins ended the season as the World Champions defeating the Cleveland Indians in a seven-game World Series, four games to three. Robert A. "Bob" DuPuy is a lawyer and former President and was Chief Operating Officer of Major League Baseball (MLB). He assumed both titles on March 7, 2002. Prior to joining Major League Baseball in 1998, he was a partner and management committee member of Foley & Lardner, a large Milwaukee-based law firm. He returned to Foley & Lardner in 2010 as a partner with the firm's Sports Industry Team. Baseball players of Black African descent were excluded from Major League Baseball until 1947. On April 15, 1947, Jackie Robinson made his major league debut for the Brooklyn Dodgers at Ebbets Field before a crowd of 26,623 spectators, more than 14,000 of whom were black. By the late 1950s, the percentage of black players on Major League teams matched or exceeded that of the general population. Hank Aaron and Frank Robinson, both Baseball Hall of Famers, threw the ceremonial first pitches, and fellow Hall of Famers Joe Morgan and Dave Winfield were on hand. Actors Courtney B. Vance and Marlon Wayans also attended the Jackie Robinson Day ceremony. Academy Award winner Jennifer Hudson sang "The Star-Spangled Banner" before the games started. More than 240 players wore number 42 in honor of Jackie Robinson's retired number,  including the entire team rosters of the Los Angeles Dodgers, New York Mets, Houston Astros, Philadelphia Phillies, St. Louis Cardinals, Milwaukee Brewers, and Pittsburgh Pirates. All scheduled games were played that day except for several games – notably the Washington Nationals-New York Mets, the Houston Astros-Philadelphia Phillies (the game and the ceremony was held on the make-up date on April 23, 2007),  as was the Pirates game against the San Francisco Giants; the uniforms were worn at the team's next home game at PNC Park – all due to a major rainstorm in the Eastern United States that postponed six games. George Kenneth Griffey Jr. nicknamed "Junior" and "The Kid", is an American former professional baseball outfielder who played 22 years in Major League Baseball (MLB). He spent most of his career with the Seattle Mariners and Cincinnati Reds, along with a short stint with the Chicago White Sox. A member of the Baseball Hall of Fame and a 13-time All-Star, Griffey is one of the most prolific home run hitters in baseball history; his 630 home runs rank as the seventh-most in MLB history. 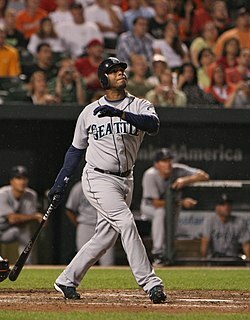 Griffey was also an exceptional defender and won 10 Gold Glove Awards in center field. He is tied for the record of most consecutive games with a home run. Seals Stadium was a minor league baseball stadium in San Francisco, that later became the first home of the major league San Francisco Giants. Opened in the Mission District in 1931, Seals Stadium was the longtime home of the San Francisco Seals (1931–57) of the Pacific Coast League. The Pacific Coast League Mission Reds (1931–37) shared the ballpark with the Seals for the first seven years before moving to Los Angeles. The Radiology Associates Field at Jackie Robinson Ballpark is a historic baseball field in Daytona Beach, Florida, United States. It is located at 105 East Orange Avenue on City Island, in the Halifax River. Old-Timers' Day generally refers to a tradition in Major League Baseball of a team, especially the New York Yankees, devoting the early afternoon preceding a weekend late afternoon game to celebrate the baseball-related accomplishments of its former players who have since retired. The pattern has been copied intermittently by other sports but has failed to catch on. The New York Mets' 1997 season was the 36th regular season for the Mets. They went 88-74 and finished 3rd in the NL East. They were managed by Bobby Valentine. They played home games at Shea Stadium. In baseball, the uniform number is a number worn on the uniform of each player and coach. 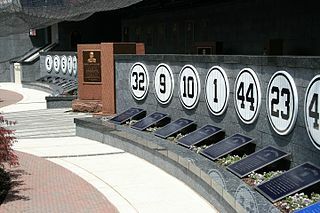 Numbers are used for the purpose of easily identifying each person on the field as no two people from the same team can wear the same number. Although designed for identification purposes only, numbers have become the source of superstition, emotional attachment, and honor. The number is always on the back of the jersey, often on the front, and occasionally seen on the left leg of the pants. Historic Dodgertown is a multi-sport facility in Vero Beach, Florida where athletes of all ages and skill levels have the opportunity to train, play, and stay together. The facility which includes the historic Holman Stadium was originally created as a Navy housing base, and was transformed into the home of Spring Training for the Los Angeles Dodgers baseball team. It has since evolved into a multi-sport destination that includes an option of room and board via their on-site villas. ↑ Rothe, Anna, ed. (1948). Current Biography, Who's News and Why 1947. New York: H.W. Wilson Co. p. 544. ISBN 9997376730. 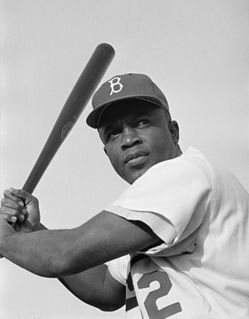 1 2 3 "Jackie Robinson, Los Angeles Dodgers Hall of Fame Baseball Player, Civil Rights Leader and Humanitarian". 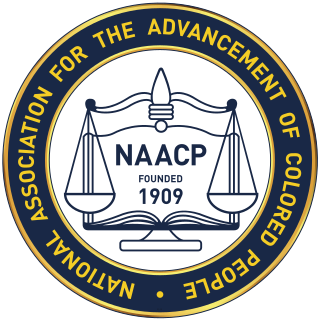 africanamericans.com. Retrieved 2008-10-08. 1 2 3 4 Bloom, Barry M. (April 15, 2008). 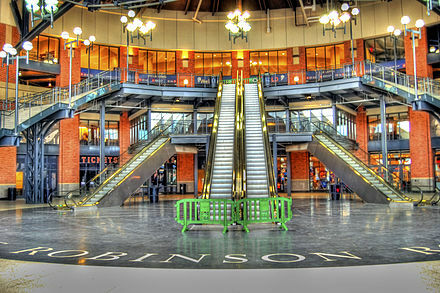 "Robinson's legacy celebrated at Shea". MLB.com . Retrieved 2008-10-07. ↑ McNeil, William F. (2000). The Dodgers Encyclopedia. Sports Publishing. p. 357. ISBN 1-58261-316-8. ↑ Freedman, Lew (2007). African American Pioneers of Baseball. Greenwood Press, 88 Post Road West, Westport, CT 06881: Lew Freedman. p. 79. ISBN 0-313-33851-5. 1 2 3 4 "MLB: Every April 15 to be Jackie Robinson Day". USA Today . March 4, 2004. Retrieved 2008-12-22. 1 2 3 "Baseball declares April 15 Jackie Robinson Day". Black America Today. March 8, 2004. Retrieved 2008-12-22. 1 2 3 4 "Jackie Robinson Day". Baseball-Almanac.com. Retrieved 2008-10-07. 1 2 3 4 5 Cowles, Christie (April 15, 2004). "Ringing in Jackie Robinson Day". MLB.com . Retrieved 2008-10-07. 1 2 3 4 Miller, Doug (April 16, 2005). "Robinson honored throughout Majors". MLB.com . Retrieved 2008-10-06. 1 2 3 4 5 "Jackie Robinson Day celebrated throughout majors". ESPN.com . Associated Press. April 15, 2006. Retrieved 2008-10-07. 1 2 "Griffey, Jr., others to wear No. 42 as part of Jackie Robinson Day Tribute". MLB.com. April 4, 2007. Retrieved 2007-04-07. 1 2 3 4 5 "'We're killing the meaning' of Jackie Day". NBC Sports . April 13, 2007. Retrieved 2008-12-20. ↑ "Baseball remembers Jackie Robinson". New York Herald Tribune . Associated Press. April 16, 2008. Retrieved 2008-09-01. 1 2 3 "More than 150 players plan to wear No. 42". ESPN. April 13, 2007. Retrieved 2008-12-20. 1 2 3 4 5 6 7 8 "Baseball celebrates Jackie Robinson Day". NBC Sports . Associated Press. April 17, 2007. Retrieved 2008-12-21. 1 2 3 "More than 330 team members expected to wear Robinson's No. 42". ESPN . Associated Press. April 14, 2008. Retrieved 2008-12-20. ↑ Pennington, Bill (April 13, 2007). "A Measure of Respect for Jackie Robinson Turns Into a Movement". The New York Times . Retrieved 2007-04-15. ↑ "Phillies, Astros pay tribute to Jackie Robinson". ESPN. Associated Press. April 23, 2007. Retrieved 2008-12-21. ↑ "Robinson family, Mets, Citi, Jackie Robinson Foundation, Major League Baseball, government leaders dedicate Jackie Robinson Rotunda at Citi Field". MLB.com. April 15, 2009. Retrieved 2010-04-17. ↑ Ladson, Bill (May 17, 2009). "Nats celebrate belated Robinson Day". MLB.com . Retrieved 2010-04-17. ↑ "Pro baseball returns to Vero Beach – for a day". Ballpark Digest. January 25, 2014. ↑ Kramer, Daniel. "MLB celebrates Jackie Robinson Day". MLB.com. Retrieved 20 April 2017. ↑ Hill, Jordan. "Jackie Robinson Day was April 15. Why are the Braves and Cubs celebrating it today?". Atlanta Ledger-Enquirer. Retrieved 15 May 2018. ↑ "Game box score". Major League Baseball. Retrieved 15 May 2018.